St. Mary is always in need of committed catechists (teachers) to lovingly and energetically teach our children about the love of Christ for each of us, prepare our children for the reception of the sacraments, and to instill in them knowledge of our Catholic faith. We understand that the lessons are important and equally so, is your presence, attitude and kindness in creating a community among the students of love, acceptance and respect. 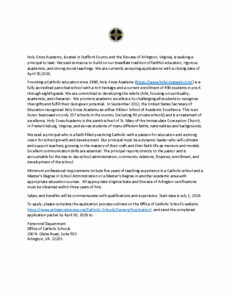 For more information on our catechist formation program, please see our Catechist Handbook. We warmly welcome you and thank you for sharing the goodness in you with our children. Please know that St. Mary Church is mandated by the Arlington Diocese to uphold the “Protecting God’s Children” Program, therefore all of our volunteers 18+ must complete a volunteer background check and attend a Virtus Seminar in order to be compliant and eligible to work with children. We take this program very seriously as we realize that our children are priceless gifts from God. Our Religious Education Office will assist you in completing all necessary paperwork.